In 1975, DC Comics launched a new “tryout” series, 1st ISSUE SPECIAL. Each issue featured a different character, some new, some established B-listers, in order to simultaneously check out fan reaction and clean house of some inventoried unused stories. The series’ 13 issues constituted quite a mixed bag, from the forgettable (#4’s LADY COP) to the okay (#7’s THE CREEPER tale by Steve Ditko) to the sublime (see below). Three issues were written and drawn by the legendary Jack Kirby, wrapping up his ambitious but ultimately overreaching stint at DC Comics. 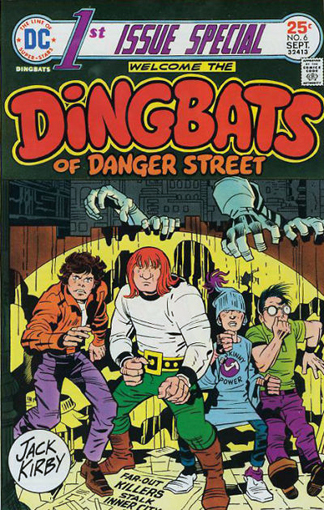 The goofiest of Kirby’s contributions was #6’s THE DINGBATS OF DANGER STREET (Sept 1975), a callback to the kid-gang comics of the Golden Age that Kirby created with his then-collaborator Joe Simon (who helmed his own wacky issues of this comic, most notoriously another kid group, millionaires THE GREEN TEAM in #2). The Dingbats (Good Looks, Non-Fat, Krunch and Bananas) do urban battle with goofy villains Jumping Jack and the Gasser in a story that feels a bit like the Sweathogs fighting crime. The only feature that spun off into a successful series was Mike Grell’s super sword & sorcery epic, THE WARLORD in #8, but I think the best issue of 1st ISSUE SPECIAL was #9 (Dec. 1975), starring the oft-misused mystical hero, DR. FATE. In a tale written by Martin Pasko and beautifully illustrated by Walt Simonson (a perfect match of artist and character), Dr. 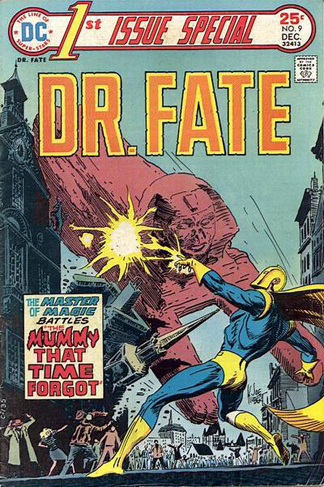 Fate fights the mummy Khalis while dealing with some domestic strife at home with his wife Inza. The story has become a classic, being reprinted by DC umpteen times over the years, but there’s something about the original package with the Joe Kubert cover and Batman Hostess Fruit Pie ad inside the cover that makes this a true Bronze Beauty. NEXT WEEK: The Invincible IRON MAN!